It’s almost summer time! Thank goodness, right? While we’re not going to be homeschooling full time over this summer, I do still have some learning activities planned. At the very top of that list are books and more books. My kids are going to be doing lots of reading this summer. I’ve chosen a variety of titles for my soon-to-be 4th grade son. 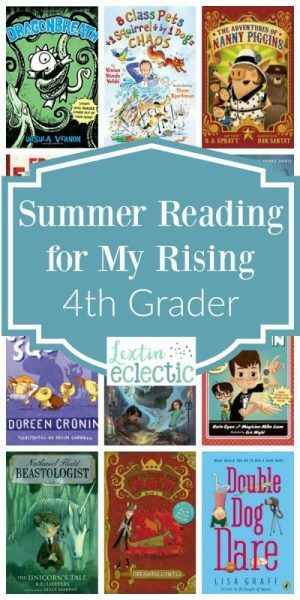 He has been a bit of a struggling reader so this list contains books above and below his reading level. I want to challenge him but also find some books that are simply easy to read and enjoyable. I think he’s going to love this book list! The school yard squirrel is chased into the school building by the principal’s dog and they are locked in for the night with a school full of class pets. What could possibly go wrong? A class of 4th graders starts out as enemies but after a battle of willpower, learn that they have quite a bit in common. Who will win the dare war? These are not your average chickens. These are karate crime fighting chickens who also solve mysteries. Poor Mike is always in trouble for his inability to sit still in school. He finds a local magic shop whose owner believes Mike can be a magician too. Has he finally found something that he could be good at? Nathaniel Fludd is called to be a beastologist, caring for beasts that need his help while keeping them safe from villains. Read to discover if Nathaniel can save the wounded unicorn while also searching for his missing parents. If you want to be initiated into the Viking clan, you must first capture and train a dragon. Is Hiccup Horrendous Haddock III up to the task? Meet Frank Einstein the kid genius who loves to create unusual scientific inventions. When a flash of lightning brings his robot creations to life, Frank gains two new lab partners. Fin is searching for his mother while Marrill is just trying to find her way home from the Pirate Stream. However, the map holds the key for both of them. What happens when your nanny is a pig? Just ask the 3 Green children who have a very unconventional nanny. Danny Dragonbreath can’t breathe fire but he does have another super power – he has no fear. This one is part chapter book, part comic book. If you need some more reading ideas, check out these great book lists! Oh, and we also have a fun family reading challenge. Read more about that here. I hope you’re inspired to start one with your own family! I love all the reading lists that you do! So awesome as I’m always looking for ideas. Thank you!! I love making reading lists! Great list! I haven’t heard of a lot of these books. But we are out of loop as we live in Tokyo currently. I will check some out on amazon! Thanks for the ideas! Will check out your other book lists as well! I love reading book lists to see what other homeschoolers are into! …..I especially like the lists of boys favorite books! I have an 8 year old boy and he crack up over the Alvin Ho series by Lenore look. Even funny for older kids and adults! Your ids might want to check them out if they have not read them. Happy homeschooling … errrr.. summer reading!! Thanks for those book suggestions! I will have to check those out. I love finding new books!